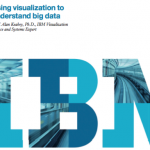 I recently wrote a whitepaper for IBM on ways in which visualization can be used to effectively understand big data. Obviously, that’s a “big” topic. For this whitepaper I focused more on the complexity of big data than on the sheer scale, and on the ways in which visualization can be used to capture complex facets of the data in a “Customer 360″ scenario where an organization may be looking to get a more complete picture of various aspects of their customers including time, social networks, key social influencers and customer relations. It starts out with a simple stacked bar chart, and builds from there to increasingly complex visualization examples. The whitepaper is available @ ibm.biz/bigdatavis. This entry was posted	on Monday, November 18th, 2013 at 3:40 pm	and is filed under Visualization. You can follow any responses to this entry through the RSS 2.0 feed. You can leave a response, or trackback from your own site. Great read, very insightful. I am a ux designer working with an analytics start-up responsible for facilitating data exploration. I am working with users and engineers to make tools that are intuitive and modular (yikes!). The visualizations in your whitepaper look similar to D3. Is this just coincidence? Any thoughts on D3 for dataviz? Thanks for the comments. Sorry for the late response, you were nearly lost in the spam trap. I like D3 for dataviz, but I also use a wide range of other tools including OpenGL, WebGL, ThreeJS, Tableau and IBM’s RAVE visualization engine (which underlies the visualizations in many of their products).